Where is the Holt Cemetery? After three trips to Pulaski County, Georgia and the major efforts made by my cousins from Georgia, we still can't find the Holt Family Cemetery. (AKA Holt Burial Grounds) According to historical information, the cemetery is supposed to be located in the Midway section of Pulaski County. The key to the location of this cemetery lies with the location of the home of DH Holt. Mr. David Harvard Holt, Hawkinsville, Route Five, died at his home Tuesday evening following a short Illness. He fell several years ago, and fractured his hip, and has been an invalid since that time. He had lived on the place where he died the past 69 years and had never been away from his home as long as a week at a time. He was a charter member of the Midway Baptist Church, and was faithful to the performance of his Christian duties. He was 72 years old and is survived by the following children: Mrs. W.L. 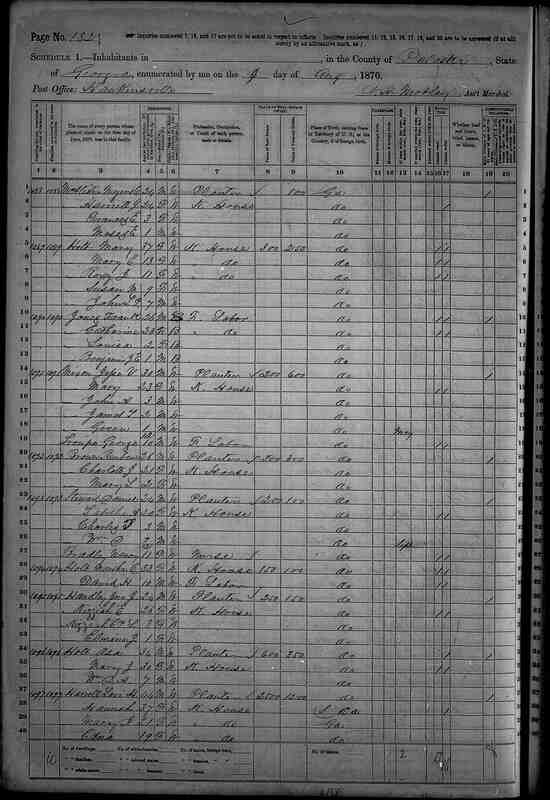 Simmons, Hawkinsville, Route Five; Mrs. Eli Vaughn, Eastman, Route One; John W. Holt, Indian Tavern, Florida, D.E. Holt, Sparks; J.U. Holt, Albany; B.B and A.H. Holt, Hawkinsville; Jeff Holt, Eastman. Funeral services were held at the home Wednesday afternoon, conducted by Rev. R.G.P McKinnon. Songs were rendered by Mrs. D.C. Blankenship, Miss Annie Bride Mullis, J.B. Parkerson and O.L. Law, with Miss Lizzie Barron at the organ. The six sons served as pallbearers. Interment was at the Holt family cemetery. According to this obit, DH Holt lived in the same house for 69 years. That means he moved there in 1863 (or was born there?) which is less than a year after his Father died during the Civil War. David’s Mother did not remarry and died in 1884 when DH Holt was 24. This means that he continued to live in the home where he lived with his Mother and remained there for his entire life. The Smith & Holt families lived right next to each other in 1860. 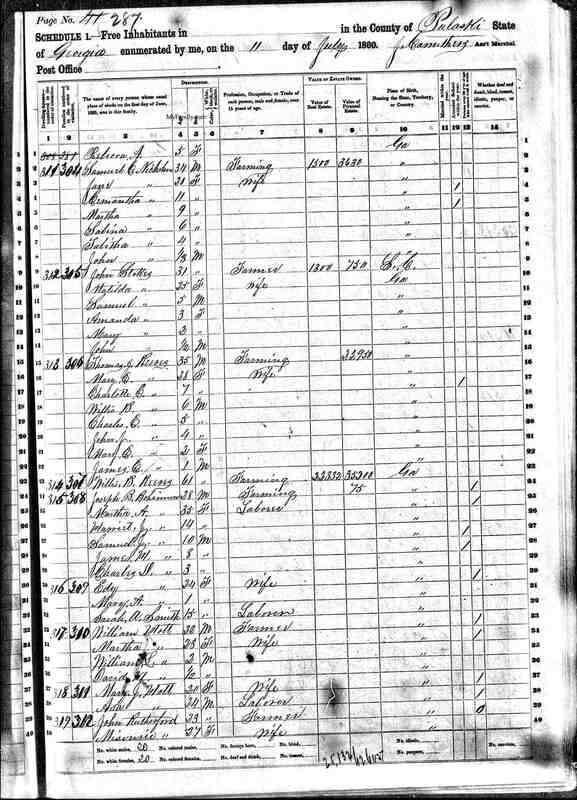 (This is the census that the Smith family was listed as Bohannon) In 1870 right after the war the Smith family had relocated to Glynn County but came back to Pulaski county by 1880. (look for Marth Singletary & SJ Smith) The two families were definately tied together in the land around DH Holt's home for many, many years. This is is an important fact! 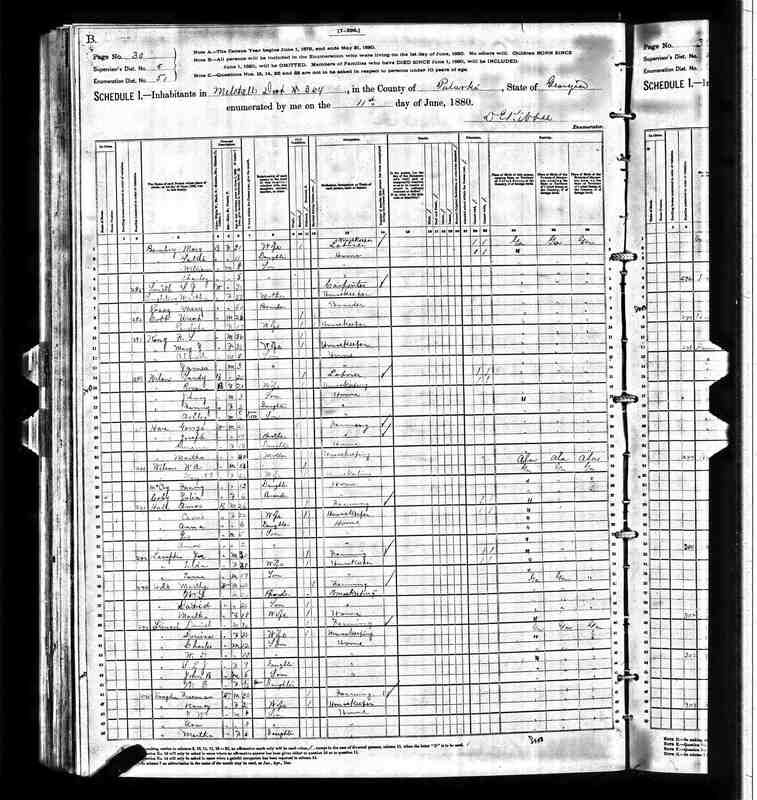 This info is the obituary for Mattie Clyde Fish-Holt the 1st wife of Albert Harvey Holt who is the son of DH Holt. The following is an exerpt taken from Dodge County Newspaper Clippings, Volume IV 1920-1928, page 1813 dated Thursday, May 10, 1923. Mrs. Henry Holt died Monday afternoon at her home on Route One of typhoid pneumonia. She was sick only a week, and leaves a tiny baby three or four months old. Mrs. Holt was seventeen years old and was the daughter of Mr. and Mrs. N.T. Fish, of Route Four. Burial took place Tuesday afternoon in the Holt Cemetery near Mr. D.H. Holt's home. The little baby will be raised by Mrs. W.H. Knight, of Eastman, a sister-in-law, at the request of the dying mother. Geographically speaking, the Holt Cemetery is given as being near DH Holt’s home in Mattie Fish-Holt’s Obit. DH Holt was married four times. The following is the obit for his wife Sarah S Harrell-Holt. The house of DH Holt is listed as being on Route Five in his obit in 1932 but it is on Route One in his wife Sarah Holt’s obit in 1920; it is the same house! The location of the Smith-Holt Cemetery is geographically related to the DH Holt house that he lived in for 69 years. All that needs to be done is to locate the house to find the cemetery. This may be easier said than done! Mrs. Martha Rebecca Knight died at her home in Fort Pierce, Florida, Sunday morning, following an illness of fifteen weeks of septicemia, caused by carbuncles. She was born near Eastman 47 years ago and had lived in this section until 1925, when she moved with her family to the Florida city The body arrived in Eastman Monday afternoon and was carried to the home of her father, Mr. D.H.Holt, where funeral services were conducted Tuesday afternoon by Rev. R.G.P. McKinnon. Songs were sung by J.B. Parkerson, Miss Nannie Mullis, Owen Law and Mrs. D.C. Blankinship, with Miss Lizzie Brannan at the organ. Five brothers and her son served as pallbearers. Interment was in Holt family cemetery. In addition to her father, the deceased is survived by her husband, Henry Knight; one son, Clarence Knight, an adopted daughter, Mary Knight; and the following brothers and sisters: D.E. Holt, Adel; J.U. Holt, Albany; John Holt, Indiantown, Florida; Jeff Holt, Eastman; B.B and A. H. Holt, Hawkinsville: Mrs. W.L. Simmons and Mrs. Eli Vaughn, Eastman. The adopted daughter Mary Knight was the daughter of Martha's brother Albert Harvey Holt and hs first wife Mattie Clyde Fish-Holt who died at the age of 17. The following is from Tad Evans Pulaski County, Georgia, Newspaper Clippings, Volume V, 1898-1907, pg. 367, dated February 2, 1906. Midway: Mrs. Martha Singletry, aged 81 years, died at the home of her son, C.D. Smith, of Dodge County, Tuesday, October 23rd, and was buried here on Wednesday, the 24th, at the Holt's burying ground. She is survived by a daughter, Mrs. C.M. McAllister, and three sons, J.H. and C.D. Smith and John Singletary and 30 grandchildren and 26 great-grandchildren, with a number of friends and other relatives to mourn her death. The following is from Tad Evans, Dodge County Newspaper Clippings, Vol I, 1873-1892 on pg. 256, dated August 29th, 1885.
LETTERS FROM MCBRYDE A GOOD MAN GONE. It is our painful duty to record the death this week of Mr. John Bohannon, which occurred at the residence of his son, Hon. John Bohannon, in this place on Saturday evening last. The deceased had reached the ripe old age of 84 years and 29 days, and in during this long decade he has ever been the true, honest, law-abiding citizen that he died. It can be truly said to his credit that he never in his career had even an argument over a debt claim--always giving his opponent the benefit of the case in question. In fact, he was of honor and integrity. Mr. B. never connected himself with any church, but his upright walk through life tells us that he had meekly made peace with Jesus. He stated to a friend, just before death came on, that he was ready to go. Oh, blessed thought! He was buried beside his long departed wife, at the Holt burial ground, almost 10 miles from Eastman, on Sunday last. Truly a good old man has passed away, and we, in common with the community, sympathize with the bereaved relatives in their sorrow. The following is from Tad Evans Pulaski County, Georgia, Newspaper Clippings, Volume V, 1898-1907, pg. 46, dated January 5, 1899. At the residence of the bride's parents, Mr. and Mrs. D.H. Holt, near Mattie, (where is Mattie?) on the 18th ultimo, Mr. W.H. Knight and Miss Pearly Holt were united in marriage, Rev. E.C. J. Dickens officiating. A copy of James Henry Smiths's Death record containing a Holt Cemetery reference can be found here.